Awesome work! Absolutely stunning. :) One of the best Splash-Screens Blender ever had! Waaa impressive : it partially answer my question from last post :) And for motion blur ? Already implemented in cycle ? Or got from internal ? You guys are going to release the blend files when mango’s completed right? Hey guys, if you can find the time, could you render out a full HD version of the image with the volumetric effects? It would make a great background for my desktop! Like always Amazing work keep at it! Images updated to high-res versions. did you unse Cycel (for shure)but how did you do the wonderfull Sun thrue the window effect? 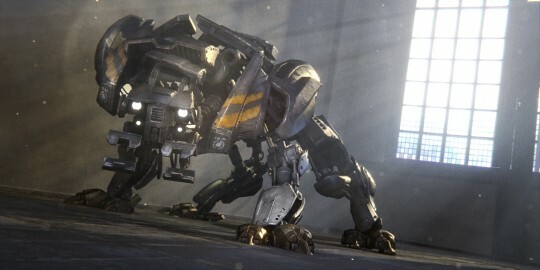 They are created using the “Halo” option in Blender Internal’s Spotlights and then combined with the image from Cycles. It’s conceivable that those are simply decorative screws and most of the actual heavy load is taken by internal fastening. Waw, I really like the Quadbot !!! “Smashbot” is very dramatic but also a little bit indecipherable (cluttered). “Splashbot” is the best ! An impressive beast, a nice composition, and beautifully illuminated ! Congrats ! Awesome, but when do we get to see Mango Bot vs Sintel Dragon.? So what issue of 3Dworld/3Dartist is this badboy gonna feature in? great work! But i got a question: How do you the image of your node setup in such high-resolution. Do you combine different screenshots together?